Info (french) : BASIC REPLAY est le label de réédition dirigé par HONEST JON's à LONDRES et BASIC CHANNEL / RHYTHM & SOUND à BERLIN. Ils rééditent aujourd'hui une série de maxis inédits en CD qui reprend quelque uns des plus grands noms du reggae tels que JACKIE MITTOO, IJAHMAN LEVI, GREGORY ISAACS, WHITE NICE ... Que de l'inédit en CD avec un son superbement dépoussiéré. 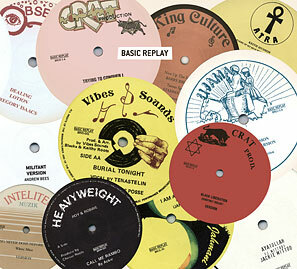 Basic Replay is a reggae reissue label run by Honest Jon’s in London and Basic Channel / Rhythm & Sound in Berlin. This album is a sampler of its releases since starting in 2004. All except two of the tracks are new to CD. The Ackie and Tenastilin tracks are from the London dancehall, killer shots from 1986 and 1992. Basic Replay’s hit 12" reissue of Rambo was the subject of articles in Wax Poetics in the US, and (a double page) Natty Dread in France. Over decades, Shaka would on special occasions unleash the staggering dub - with its foghorn effect - of Ijahman’s rare, resplendent first version of I am A Levi (recorded in London in 1974). Also the apocalyptic Ayatollah, recorded by Jackie Mittoo post-Studio One, in New York. From Canada, King Culture’s stunning dub of Barry Brown is surely the deadliest cut of the mighty Cuss Cuss rhythm. The Courtney Melody, Chuck Turner and White Mice are classic no-mercy Stateside digi sufferers - from just a few years ago, the Andrew Bees (the Black Uhuru singer) is in the same lofty tradition. 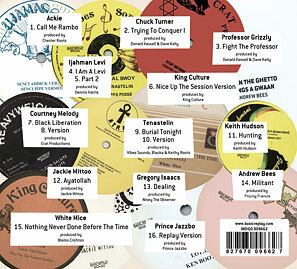 Keith Hudson’s LP masterwork Flesh Of My Skin is represented by its opener, featuring Count Ossie; alongside cruelly brilliant, deeply grooving productions by Niney The Observer and Prince Jazzbo which epitomise the label's appeal to the reggae cognoscenti over the last three years, but crucially also beyond, to fans of dubstep, techno, anything tough and worth a listen.